As one might assume, traveling with show dogs is a complicated process. From obtaining proper veterinary documentation to finding the perfectly-sized crate, getting the Best in Show winner from one city to another is, unsurprisingly, difficult. In fact, these dogs are subjected to the same travel regulations as all other pets. Their owners, on the other hand, take extreme measures to prevent unnecessary discomfort. 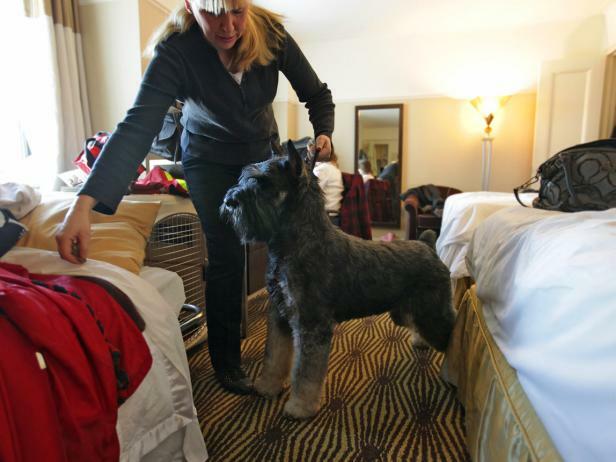 Unless an animal lives in New England or America’s mid-Atlantic region, a trip to the Westminster Dog Show often entails a flight. This form of travel can be extremely uncomfortable for dogs, especially for larger breeds; big dogs often have to ride in cargo, which can be very hot, very cold, and/or very loud. To decrease the accumulation of stress, owners will often prioritize direct flights to their destination: JFK or LaGuardia. If a contestant is from a more rural part of the country, an owner might drive as much as ten hours to avoid having a layover. These pet parents mean business, and they know exactly what their dogs need to be comfortable. Some animals, on the other end of the spectrum, receive the royal treatment. Inge, a white Standard poodle from Houston, flew to the show via a private jet in 2018. She was then chauffeured to a hotel in a private van with her vet, stylist, handler, and personal photographer. Some dogs really do receive the royal treatment, but this is a rare privilege. If a dog is in the Westminster Dog Show, he or she has participated in a previous competition. This often means they have travelled a great distance in the past—though they may not be used to travel conditions, it is nothing new for these consummate professionals.